The new version of SearchMyFiles utility provide a new search mode that allows you to easily find duplicate files in your system. When you switch to the new ‘Duplicates Search’ mode, SearchMyFiles scans the files according to your preferences, like it does in the regular mode, but instead of displaying the list of all files, it only displays the files with identical content. In order to start using the duplicates search, simply set the Search Mode combo-box in the search options window to ‘Duplicates Search’. It’s also highly recommended to narrow the search by setting time, size or subfolder depth restrictions, because if don’t set additional restrictions, the duplicate search might be very slow. During the duplicate search, there are 2 stages. In the first stage, SearchMyFiles scans all files and folders according to your selection, but without adding any file to the main window. The scan in the first stage is only made for collecting the files list, but without reading the files. In the second stage, SearchMyFiles compare all files with equal size, and when it find 2 or more files with identical content, they are added to the duplicates list in the main window. Each chunk of duplicates files are painted with different color (There are up to 64 different colors) and there is also a ‘Duplicate Number’ column, which allows you to easily sort the list according to the duplicates order. You can find the latest version of SearchMyFiles utility here. Posted by NirSoft on December 24, 2009 at 7:41 am under Utilities Update. in extension.nirsoft.net, a Web site which contains file extension information submitted by users of FileTypesMan utility, the Popularity field is now active, and displays one of the following values: Low, Medium, High, and Very High. The Popularity is calculated according to the number of submissions received for the specified record. 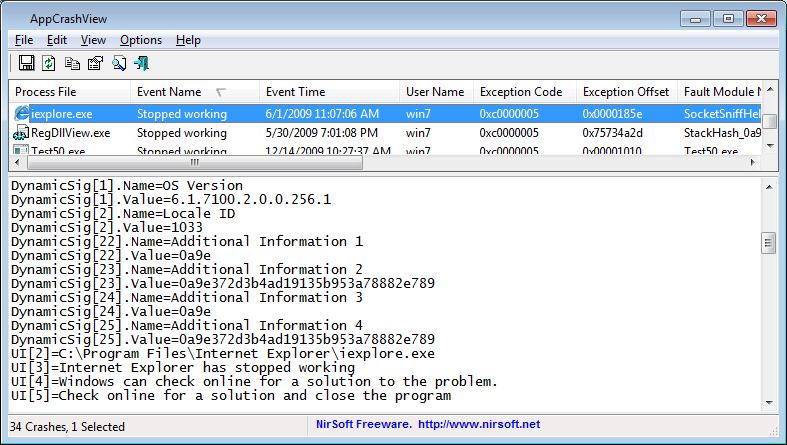 Posted by NirSoft on December 23, 2009 at 5:41 am under Web Site Updates. usbspeed.nirsoft.net, a Web site containing speed tests results of USB flash drives submitted by users of USBDeview utility, accumulated a total of more than 5500 speed tests. So it’s time to do something with this speed tests database and make it more useful: I created a new summary page, which contains the average, maximum, and minimum values for both read speed and write speed. This page only display the information for common USB drives that accumulated at least 5 speed tests. You can view the summary page of USB speed tests in this link. Posted by NirSoft on December 22, 2009 at 12:57 pm under Web Site Updates. 2010 is almost here, so it’s time to announce about 10 new utilities that will be added to NirSoft collection in the incoming months. 8 of these utilities are already in advanced development state, while the other 2 utilities are only in ‘planned’ state, and it’s still possible that I’ll replace them with other ideas. The first utility, FlashCookiesView, will be released in the incoming week, and the others will be gradually released in the first quarter of 2010. FlashCookiesView: Just like it sounds, this utility displays the list of cookies files and their content, created by Flash component in your Web browser. The first version won’t allow you to edit the cookies, but it’s possible that this feature will be added in the future. DiskCountersView: This utility displays the system counters of each disk drive in your system, including the total number of read/write operations and the total number of read/write bytes. It also displays general drive information, like disk name, partition number, partition location, and so on. DiskSmartView: This utility displays the S.M.A.R.T information extracted from IDE disks. This information can be used to detect problems in the hard-disk. WinPrefetchView: Each time that you run an executable file in your system, Windows creates a Prefetch file (.pf extension) under C:\windows\Prefetch, which stores information about which files this application use, so in the next time, Windows will be able to optimize the application loading process. 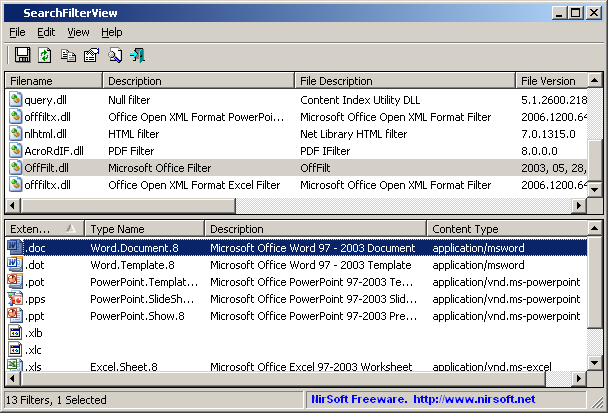 WinPrefetchView utility allows you to view the content of these .pf files, which generally shows you the list of files that the application used. 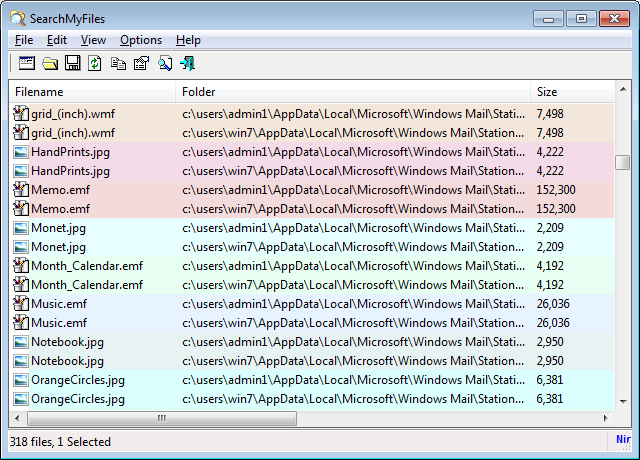 BulkFileChanger: This utility is the successor of my very old ‘FileDateChanger’ utility. It’ll allow you to add multiple files from multiple folders (by wildcard, by drag & drop, and so on) to the list, and then make some operation on all of them at once, including: date/time change, attribute change, copy/paste, cut/paste, and maybe rename too. AppCrashView: On Windows 7 /Vista, every time that application is crashed, a .wer file is created, which contains the information about the crash. This utility will allow you to easily watch the content of these .wer files. SearchFilterView: When you search the content of files with Windows search, it uses the right search IFilter plugin according to the file extension. This utility allows you to easily view the search filters installed on your system, as well as to add/remote extensions associated with these filters. NTFSLinksView: Starting from Windows Vista, Microsoft use symbolic links and junction points of NTFS file system in order to make changes in the folders structure of Windows and keep the compatibility of applications written for older versions of Windows. 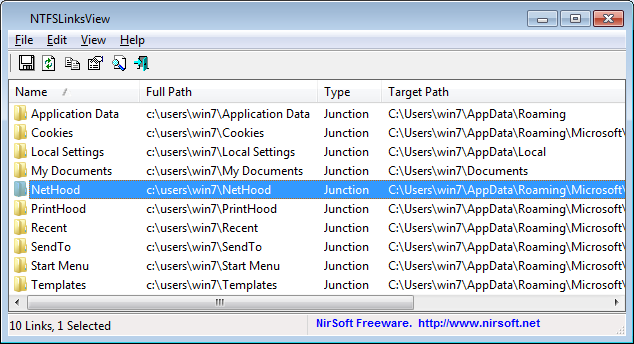 This utility simply shows you to list of all symbolic links and junctions in the specified folder, and their target paths. WakeMeOnLan: This utility will collect information about IP addresses and their associated MAC addresses on your LAN, and when you need it, it’ll allow you to send Wake-on-LAN packet to the desired computers in order to turn on these computers. OperaPassView: Just like it sounds, a utility to recover the passwords stored by Opera Web browser. Posted by NirSoft on December 17, 2009 at 12:31 pm under Utilities Update.